Leduc Physio - Physical Therapy and Massage Therapy ServicesPhysiotherapyFoot PainAre your shoes supporting you? The best shoes for you this summer. Whether you are indoors or outdoors in spring, summer, fall or winter you will almost always have something on your feet. This means your feet take a beating all day every day, which can cause a variety of foot pain. One way to keep your feet happy this summer is to wear supportive shoes. Today there are so many different kinds of shoes, it’s a wonder anyone knows which pair to buy. There are multiple features which make a supportive shoe, and none demand velcro straps or extra foam platforms. 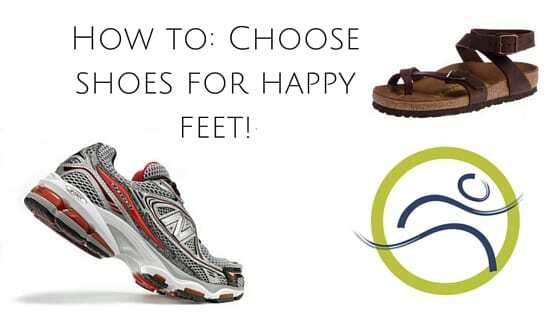 Here are some tips and tricks to find yourself a good runner and sandal for your summer adventures this year. #1: Heel- The heel of the shoe should be rigid, and not collapse when pressed on. When wearing the shoe, laced but not tied, your heel should feel snug without biting, pinching or rubbing. #2: Arch/Midfoot- The shoe should barely twist between the arch of the shoe and the heel (when rung like a wet rag). Avoid shoes with a big chunk of the sole missing from the arch of the shoe, this will cause the foot to fall inward and can lead to knee, hip and back pain. #3: Toe/Forefoot- Leave space for your toes! There should be a thumbs width space between the end of your toes and the toe of the shoe (this prevents blisters, black toenails, and allows the forefoot to change positions on uneven ground). Tips: Shop for shoes in the evening; your feet swell during the day and will be at their largest by 4:00 pm. Never assume your size, Get measured, because your shoe size may have changed slightly since your last shopping spree. You may be a different size in a different brand of shoe. Not all brands fit the same so if things don’t feel right, try a different size. #1: Sole- There really isn’t very much to sandals, the base of the shoe is the most important part. Soles should be supportive and ideally have some cushion and arch support. FYI flip flops usually have neither of these! #2: Straps- Everyone has different feet, so shoes need to be somewhat adjustable for a blister-free fit. When looking for a sandal, choose one with adjustable straps around the rear of the foot as well as the front. This prevents the toes from constantly gripping the shoe to keep it on the foot. If you are already suffering from foot pain and these tips aren’t enough, it may be worth considering an orthotic device! Happy shopping for happy feet!